Atlantic-models manufactures high quality scale models. From desktop and wall-mounts, to large outdoor displays, exhibits and hanging models. We´ve got your fully customized solution. Contact Us or call at our office 305.883.2012 and we can make your dream project real. There's no place like it in on earth! 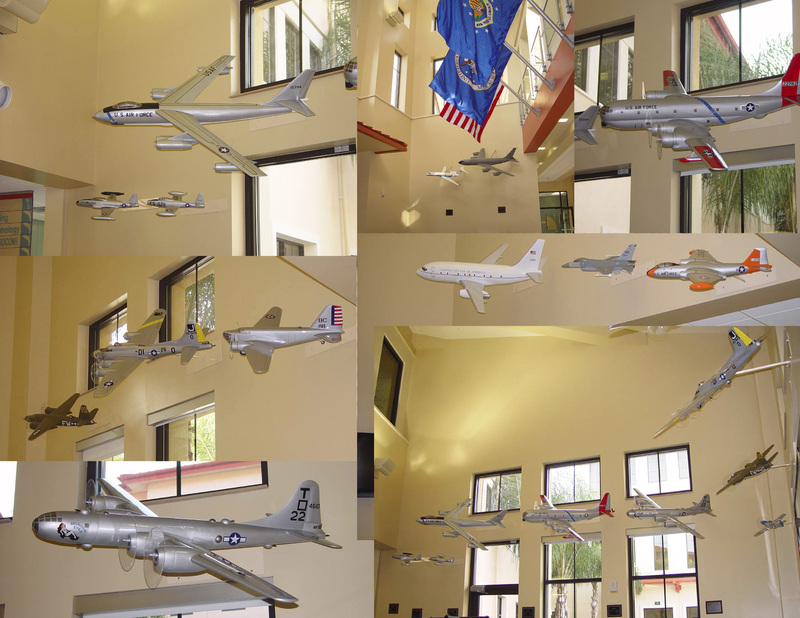 Atlantic Models, located near Miami International Airport, creates the most lifelike aircraft models in the world! This is a short report on our trip for the installation at the Boeing Global Services facility in Plano. From the floor to the ceiling, it was 47 feet tall. The largest model is 10 feet long, and the shortest about 8 feet. The 10 foot model had about 3 inches of clearance to the glass sides. We had two access holes. One on the roof that we brought 4 models in, and one access on the floor for 4 models. Both access panels were 3 feet square. The models brought in, in pieces, and assembled on the inside. They were hung on a 1.5 inch diameter stainless tube, and a rotating turn table on the bottom. One full rotation takes about 3.5 minutes. Scaffolding were removed as we installed each model. Total installation time spent, about 12 hours. It was a challenging install, but came out like we all wanted. Museum of Aviation, Warner Robins AFB, Georgia. 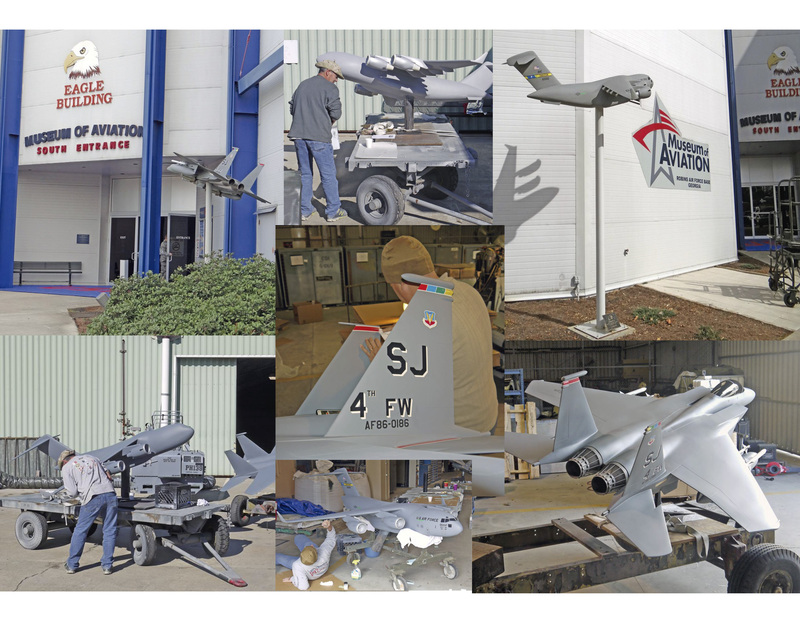 We originally installed the C-17 and F-15 models a little over 7 years ago. When it came time to give them a refreshed paint scheme, we got the call for the "Go Team", me (Roger), Eddy, and Gino. We worked in one of the museum restoration buildings. Great fun to be there, and around their other projects. We arrived early each morning (4 mornings) and worked until the evening each day. We got done mid morning on the 4th day. Then we ran around the museum until about 4 pm. The museum has changed a lot over the last 7 years. If it has been awhile since you have been there, you must visit it now. Tremendous growth, and great plans for the future. It was after that, that we then headed over to Chic-fil-A to do their installations. We got done about 10:30 that night. We were too excited to get home. So, we headed to Miami, arriving a little after 5:30 am. Long, and fun trip! Chick-fil-a anyone? 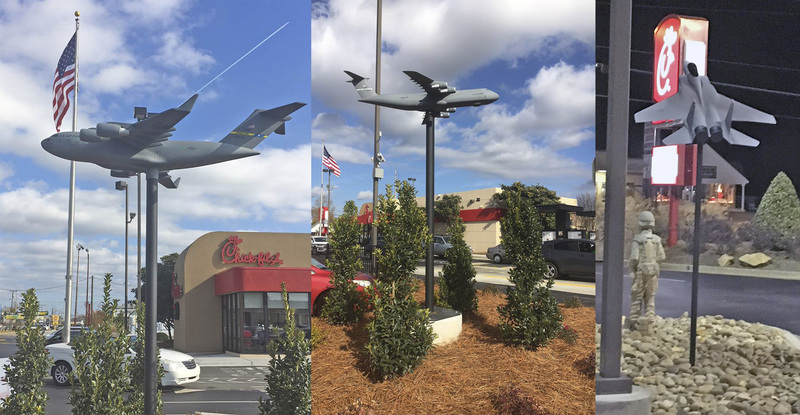 Warner-Robins GA. We had the distinct please to install one, C-17, one C-5A, and one F-15 at the Chic-fil-a store on 1867 Watson Blvd. They LOVE our Warriors, and our Warriors love Chick-fil-a. Thank you Chic-fil-a. Try the chicken, it is GREAT! McConnell AFB, Wichita, Kansas. October 2017. Another pair of models delivered and installed by Atlantic Models. The KC-135 is a scratch built, 1/20 scale and the KC-46A is a 1/24 scale version of the USAF new tanker. McConnell is the sharpest Air Base we have ever been on. The folks as usual, are great. Thank you McConnell AFB for the opportunity to serve you. Father and Son, Gino, and Jr. off to Wright-Pat AFB. 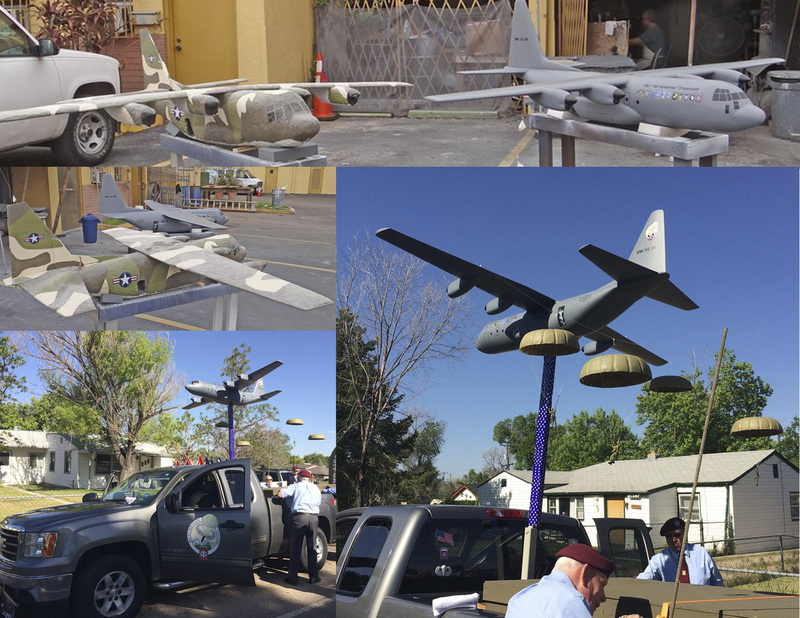 We installed this pair of 1/24 scale aircraft last Thursday in front of the "SPO" (Support Projects Office. 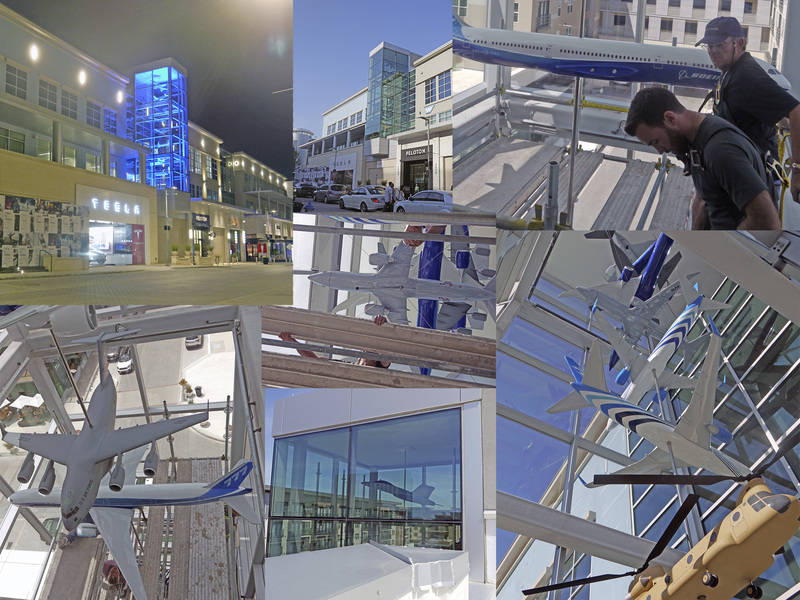 The original installation was knocked out by a storm that took part of the building roof and crushed them. Horrible! But now pretty again. Gino built the plane, and Jr. did the art work for the decals. This was Juniors' first first field trip. Local support by Ivan from the shipping department of Wright-Pat. Thanks Ivan! Fun had by all. On Monday, April 3, load truck. On Tuesday, Roger, Gino, and Eddie head 647 miles up to Fort Walton Beach. Wednesday, effect install. 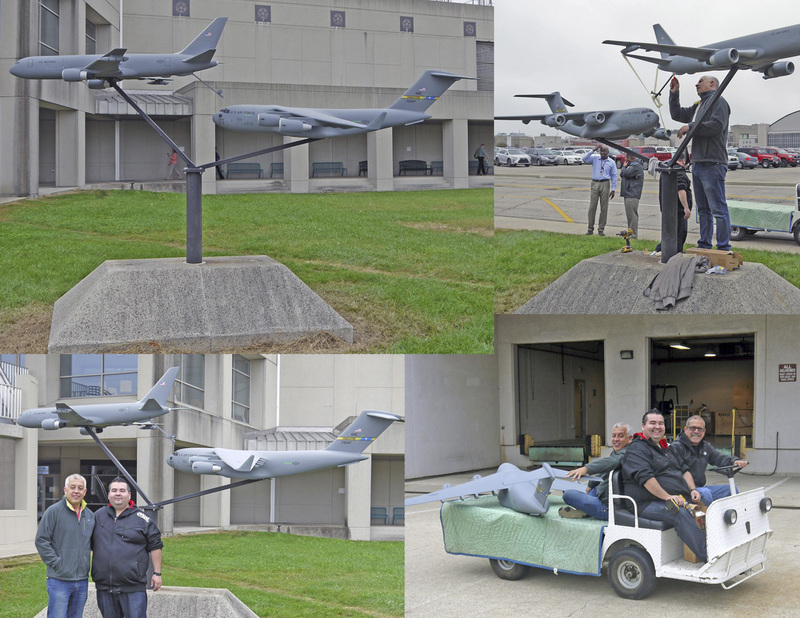 Thursday the model was dedicated by AFSOC. 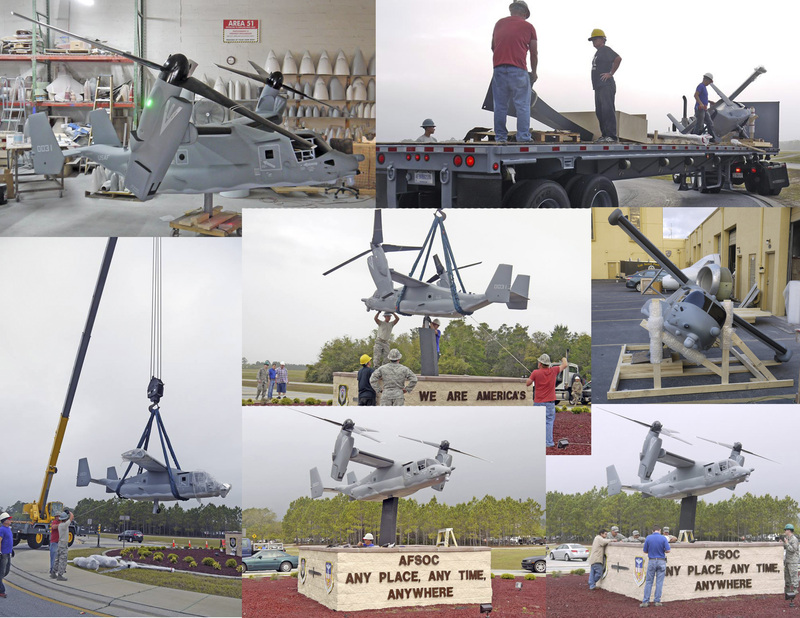 This 1/4 scale CV-22, aircraft #0031 represents both the group, and this particular aircraft was lost in Afghanistan with the loss of two brave crew members. They will never be forgotten! Thank you Boeing for allowing us to be a part of this historic event. We all had our fingers crossed that the model would travel well, and withstand the 70 MPH road speed. It came through with "flying colors". Nothing broke off! No love bugs to clean. For us, this is the best installation we have ever done, and could not be more proud. 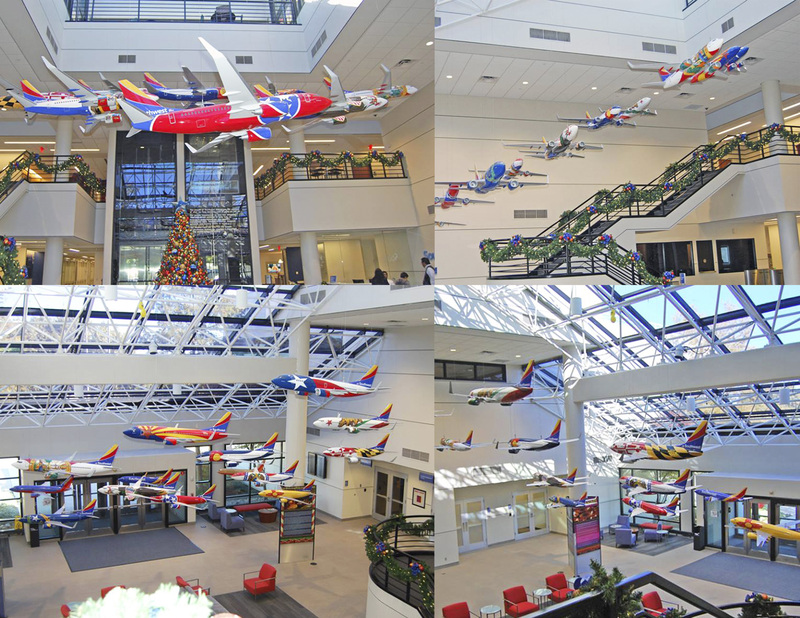 Merry Christmas at Southwest Airlines Headquarters. Betsy and I visited Southwest on Thanksgiving week to attend their annual Bazaar. We got to take pictures of these models that we had repainted back in June. One of the words that comes to mind is "scrumdeliecious", another is yummy, and striking as well. They are all 1/20 scale. 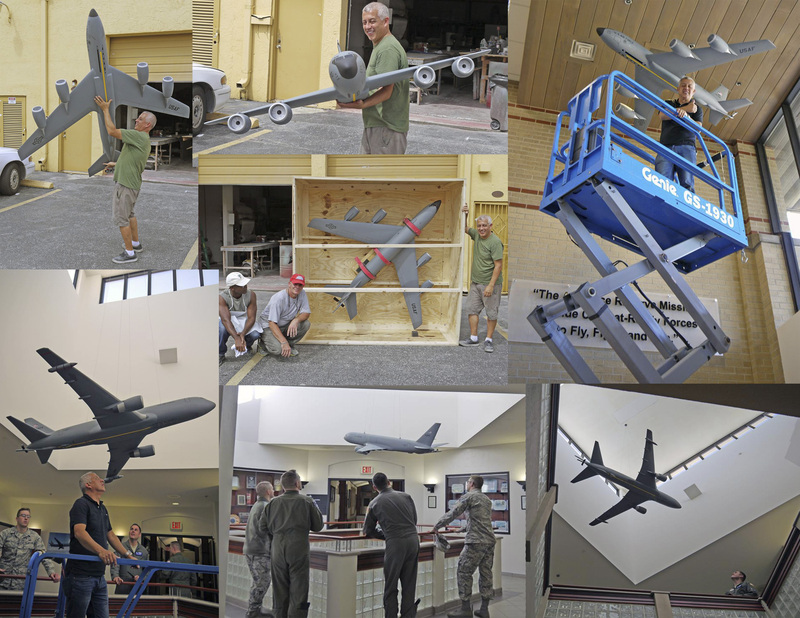 A batch of 1/20 scale models built for MacDill AFB, Tampa. 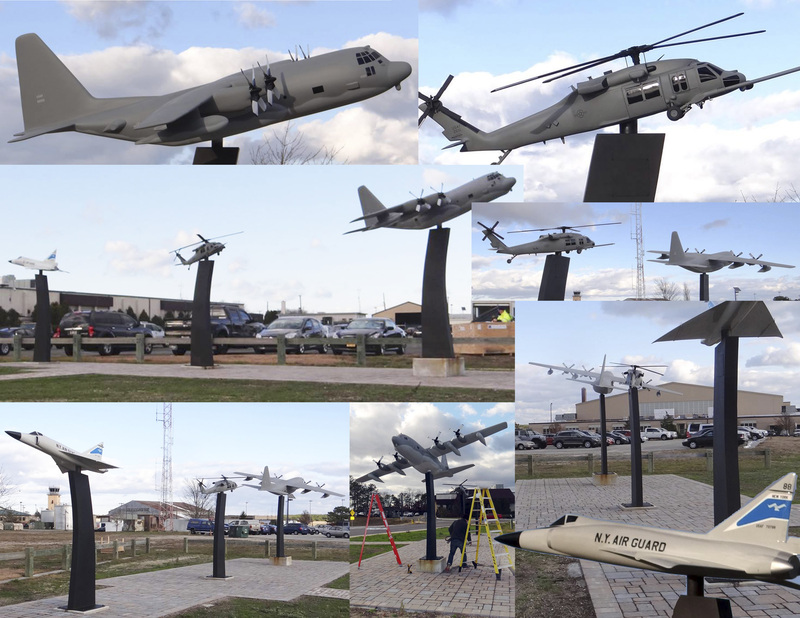 This project was to display a large part of all the airplanes that have operated out of this base. All except two were scratch built. This was all about fun and pride. When you walk into the space, it takes your breath away. 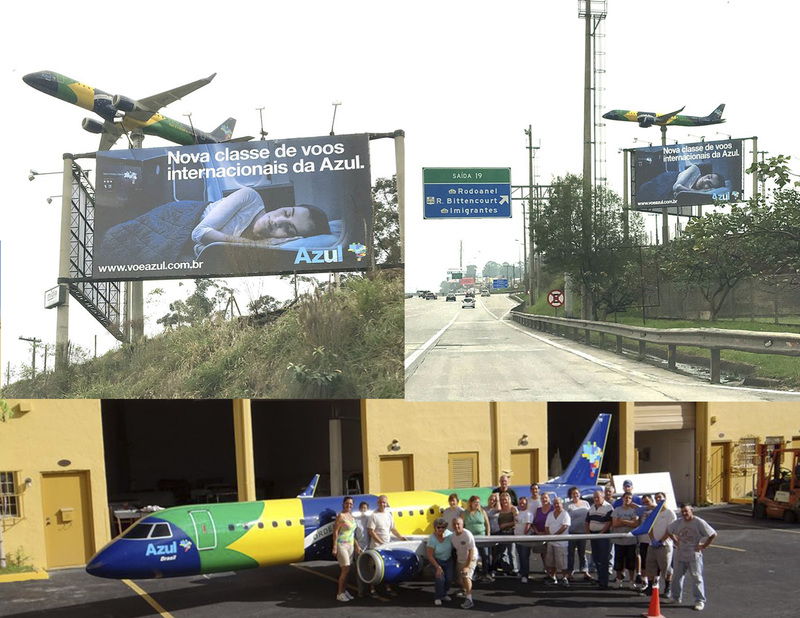 Azul, 1/3 scale E-195, 42 feet long, 31 foot wing span. Rafael de Moura Fermann visited us from Brazil and told us he had seen the model along the highway. We never got any pictures. He promised to get some photos of the model installed. He got them! Thank you Rafael! I got a call from our good buddy Jon Proctor asking if we could assist his buddy Bob, member of the 82nd Airborne Chapter in Denver with their need for a model. I spoke with Bob, and we agreed to refurbish the old one they had been using for some 20 years. When it arrived, we felt it was time for an upgrade. While we had promised to refurbish the model, we could not help ourselves and built them a new one. We are SO proud of them, and they got it just in time for the Memorial Day parade yesterday. Go 82nd Airborne! Thank you for you for the freedom we all enjoy. God Bless America. 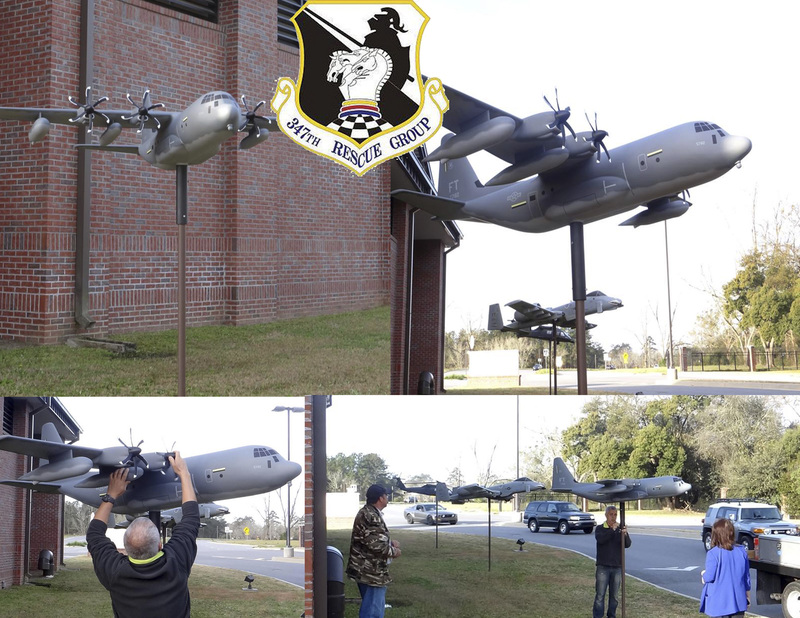 Moody AFB, Valdosta, GA. C-130J arrives and installed at the base entrance early Thursday morning. Eddie and Gino did a great job scratch building this one. See them posing with the big bird in the paint booth prior to shipping. This airplane is a replica of the 2500th C-130 produced. Lucky boys and girls to get this airplane. What a machine! Thank you Warfighters. "Aero Art by Atlantic". When The Jet Set asked if we could develop a "wing desk" to be used to shoot the pilot for their new program, we jumped right in. The first desk was a short 6 footer (seen with Gino). They program was sold, but they needed Wing Desk #2. The table is almost 10 feet long and we get a peek of it on the new set with the first photo. The other photos shot in our parking lot! The earlier version is available to use in your Man Cave. Not only can you use the legged version, but you can also wall mount the wing root and use a single leg at the wing tip. Between us, we sketched it out, and made it just for them. Looking for that really special desk, custom made for you. Give us a call. Francis S. Gabreski Air National Guard Base, Westhampton Beach, New York. These 3 models we did are in 1/8 scale. Installed this past week. Custom made for the 106th Air Rescue Wing. It was from this base that the HH-60 Pave Hawk departed on it's ill fated mission to help the Andrea Gail caught in what was to become "The Perfect Storm" that was the basis of the movie. These folks are special. Their motto is "So that others may live". God Bless all of them!